NIDA’s Advisory Council periodically reviews the various programs and Divisions within the Institute to ensure they best reflect NIDA’s capacities and mission. At our May 2015 Council meeting, an Advisory Council workgroup presented a series of recommendations related to the scientific areas currently led by the Division of Clinical Neuroscience and Behavioral Research (DCNBR). The workgroup recognized the accomplishments and value of the diverse scientific portfolio and significant achievements of the Division however attrition in staffing led the workgroup to recommend either filling those positions to maintain critical expertise, or spreading the expertise of DCNBR across NIDA by incorporating DCNBR’s portfolio into other existing, modified, and/or new divisions. The latter recommendation was made to better represent NIDA’s current and future research priorities, including the emergence of new scientific areas and translational opportunities. While NIDA has developed an initial proposal to guide our efforts, to proceed in the wisest possible manner with this reorganization, I am inviting input from the research community and wider public on strategies to strengthen and integrate the scientific areas currently supported by DCNBR throughout the Institute. DCNBR comprises three branches: the Clinical Neuroscience Branch (CNB), the Behavioral and Brain Development Branch (BBDB), and the Behavioral and Integrative Treatment Development Branch (BITB). Our proposed restructuring would first incorporate the clinical neuroscience, human genetics and developmental neuroscience portfolios that are currently within CNB and BBDB into the Division of Basic Neuroscience and Behavioral Research (DBNBR), to create a new Division of Neuroscience and Behavior (DNB). The current branches within this new DNB will be reorganized (by science and staff) and renamed to reflect the broadened scientific focus of the Division and a more translational approach. Second, longitudinal cohort studies and genetic epidemiology studies currently managed within DCNBR’s BBDB, as well as studies of how to better bring treatments into real world settings (effectiveness/implementation) from BITB, will be integrated into the Division of Epidemiology, Services, and Prevention Research (DESPR). The Council workgroup also identified brain development as a scientific area critically important to advancing the mission of NIDA in coming years, especially with the imminent implementation of the 10-year ABCD Study. On its recommendation, a new Brain Development workgroup will also be added to NIDA’s existing set of Trans-Division Research Teams. Lastly, studies related to intervention development and testing and combined medication and behavioral therapies will be integrated into the newly developed Clinical Research Grants Branch within the Division of Therapeutics and Medical Consequences, renamed from the current Division of Pharmacotherapies and Medical Consequences of Drug Abuse to reflect its broadened mission. This integration of research on behavioral interventions with research on other forms of treatment reflects an increasingly mechanistic direction that NIDA has been taking in this area—for instance, thinking of addiction in terms of specific brain circuits and how behavioral, pharmacological, and combined treatments might target them simultaneously to produce improvement. It also better reflects new nondrug treatment approaches currently on the horizon, such as transcranial magnetic stimulation and direct current stimulation. In addition to the changes to the programs directly managed by DCNBR, a consistent goal has been to enhance collaboration and synergies across different areas of science. This goal will be accomplished through the establishment and strengthening of Trans-Division Research Teams/Workgroups. The purpose of these Teams is to increase the effectiveness of the interdisciplinary collaborations and translational efforts which are essential to maximizing the impact of NIDA science. Topics covered will include the Brain Development workgroup (mentioned above) as well as other workgroups addressing other areas, including big data, tobacco, neuroscience and genetics. These are some of the ideas we have been considering, but I invite your ideas and input about possible scientific opportunities to be considered with this reorganization. Please post your comments here or email them to NIDAOrgComments@mail.nih.gov by June 24, 2015. I am eager to hear your thoughts. The plan looks fine but I'm curious about the intended balance between funding studies whose results can be directly applied to improve treatment and discovering new findings that might lead to a better understanding of the biology of substance use disorders and lead to new treatments? Basically, applying what is known to areas where it could but is not being applied vs more distant goals that could eventually lead to major advances. This is a response to your invitation dated 6/12/15 to comment on the proposed reorganization of DCNBR. I write as somebody who was briefly supported by NIDA, among other institutes, more than twenty years ago as part of the Human Brain Project. That support was responsible for most of the breakthroughs that have driven my career since then. I had always hoped that someday I might have the opportunity to draw some inferences from this experience for the health of NIDA as a whole, including its intramural part. So maybe you should consider this emailed comment as a tardy debriefing about my experience back in the last century as it might relate to the purpose of your currently proposed reorganization, which, the website says, is intended to "better represent NIDA’s current and future research priorities, including the emergence of new scientific areas and translational opportunities." The possibility I would bring to your attention centers on this last phrase of the quote, the "translational opportunities." Across the biomedical sciences in general, such concerns have benefitted to a great extent, particularly recently, by a specific concern with the multiple scientific roles of information. I am not referring here to "big data," which is already mentioned in your list of transdivisional workgroups, but instead the more formal concern with the way notions of information interact with neurological structure and function at all of the levels of science that NIDA pursues, from the molecular through the synaptic to the behavioral and intergenerational. You have put forward a reorganization into three branches that are differentiated by their scientific style. 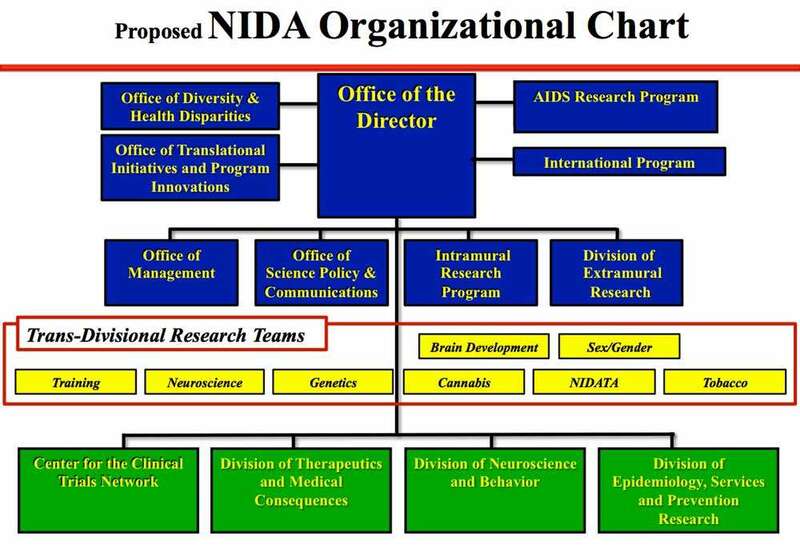 This corresponds to the current structure of NIH as a whole, which is likewise divided up by focus, but it does not actually correspond terribly well to the organization of biomedical knowledge per se, present or future, as it conduces to the most successful translations, especially the behavioral translations that are so central to NIDA's explicit concerns. And so my suggestion is that a fourth entity be considered as a component of this proposed reorganization of DCNBR, an entity that specializes (although that is the wrong word; perhaps it should read "generalizes" instead?) in the nature of scientific information and inference as it flows back and forth among the multiple domains and myriad methodologies of the remit of the current DCNBR. Neither NIDA nor any other Institute, as far as I am aware, is currently working on problems of cross-level numerical inference of this genre: problems like the prediction of behavior (which is, after all, the expression of a lifetime of habits) by structure, or the changes in the rhetoric of epidemiology when a field must integrate (as NIDA must) risks arising variously from the gene, from social structure, from parenting, from the life course, and from exogenous medical causes. In your pursuit of the "increasingly mechanistic" aspects of behavioral interventions, there will be a need for serious enrichments in the statistical and psychometric language of "interventions on who? on what?" -- the fact that addictive behaviors mean different things to different lives at different stages. For all of these reasons, I suggest that the proposed reorganization would benefit greatly by the addition of a component (not necessarily a large one, but one having an explicit label and mission) that helped the new investigations with the specific task of translation across levels, not just from molecule through cell but higher to organ, organism, life course, and community. Such a methodology core would not sit as well in any single new component of your proposed reorganization as it would function were it identified with its own brand-new focus, not a "transdivisional research workgroup" but a permanent commitment in service to the larger NIDA mission: to integrate information from wildly different scales of time and space, from insruments and questionnaires and biographies alike, into supple and flexible tools of pattern analysis aiding discoveries that link all these levels. That task -- the construction of a new pattern analysis engine corresponding to the new transdisciplinary design -- would be the true structural innovation corresponding to your commitment to the effectiveness of the interdisciplinary collaborations that, in turn, will "maximize the impact of NIDA science." in Canada THIS June 28, 2015 - July 3, 2015? Certainly you are collaborating with the International Community on the research being done worldwide, correct? What did you learn from the 2013 symposium in New Zealand? It is unclear to me what the proposed reorganization will mean for the role of prevention research in NIDA’s research priorities. I am concerned that the reorganization will reduce NIDA’s commitment to prevention science. For example, will the proposed trans-divisional research teams pay equal attention to prevention and treatment? I strongly support the recommendations the Society for Prevention Research made in response to NIH Request For Information (NOT-DA-15-005) about NIDA’s FY 2016-2020 Strategic Plan. The Institute of Medicine concluded that the most effective way to halt the manifestation of substance use and allied behavioral health disorders is through prevention. It is imperative that NIDA increase, not decrease, the percentage devoted to prevention studies for continued progress in population health. I urge NIDA to give prevention a more prominent role in its strategic and reorganization plans to support this goal. Thank you for the opportunity to comment on the planned reorganization of NIDA. I have several comments about the reorganization summarized below. I think it makes sense to locate the longitudinal and genetic studies in DESPR from the DCNBR’s BBDB and BITB. The Epidemiology branch of DESPR has supported longitudinal studies to understand the bio-psycho-social-environmental predictors of substance initiation, regular use, problem use and substance use disorder and has the experience to manage this portfolio. If these studies are transferred to this branch, I recommend that the annual new funding portfolio for these studies include the combined resources of both branches for at least 2-5 years as DESPR reconciles the various research agendas of the two branches. I am also supportive in bringing the translational, implementation treatment research into the Clinical Research Grants Branch within the Division of Therapeutics and Medical Consequences. I strongly object to bringing research on Prevention into the Clinical Research Grants Branch and recommend keeping Prevention in DESPR. NIDA funding has been essential in building the prevention science, and from a public health perspective must continue to grow support for new prevention intervention research and prevention expertise among its program staff without creating a competition for focus or intervention research funds between treatment and prevention. The Prevention Branch within DESPR must be maintained and funding for it should be increased, perhaps through savings from the consolidation over time of the etiological research from reorganizing the predictive studies in the Epidemiology branch. Reserch to develop new treatment interventions should be housed elsewhere. In the paragraphs below, I provide a rationale for keeping Prevention in DESPR. Prevention research will contribute more to the reduction of health care costs, DALYS reduction, and will have a greater impact on the public health than treatment research. Concerns over the rising costs of health care persist and remain important for most Americans. Unfortunately, and too often, NIH and American society’s response to major problems has been reactive. Such responses have evolved out of understandable efforts to deal with problems once they have emerged. We have devised treatment systems for most of the common and costly substance use and allied psychological and behavioral disorders. However, some of these systems have actually increased social inequity (Western & Petit, 2010). Each year, over six million young people receive treatment for mental, emotional, or behavioral problems. The financial costs for treatment services and lost productivity attributed to the related behavioral health problems of depression, conduct disorder, and substance abuse are estimated at $247 billion per year (O'Connell ME, Boat T, Warner, 2009; Woolf, 2008). These costs are for a system that only reaches a small portion of those in need of treatment. While treatment of existing problems remains a critical service of behavioral health care, there is widespread recognition and empirical evidence from over 40 years of research that we can prevent substance abuse and behavioral health problems from developing in the first place (Catalano, Fagan, Gavin, Greenberg, Irwin, Ross, Shek, 2012.) We must increase that focus to have substantial impact on rates of disorder and related harm. Major advances in reducing the incidence and prevalence of addiction and behavioral health problems become possible with the continued development of prevention science and the opportunities for more integration of prevention into health care through the Affordable Care Act. The Institute of Medicine report on prevention (O’Connell et al., 2009) documents that numerous controlled trials of interventions across development have shown prevention of substance abuse is possible. Many of these interventions exhibit effects long after intervention exposure, and most provide a significant return on investment in terms of reduced personal and societal costs (Biglan, 2015). The report on prevention from the Institute of Medicine (O’Connel, et al., 2009) highlights the contribution that NIDA has made to the progress of prevention research. Their conclusion is clear: the most effective way to halt the manifestation of substance use and allied behavioral health disorders is through prevention. Despite this, prevention research remains a small portion of the NIDA portfolio, 8% in 2012, which is less than half the proportion allotted to treatment intervention research (17%), and the percentage of prevention in 2012 representa a 20% decrease from 2011 (Sloboda, 2012; 1564). I think that increasing, not decreasing, the percentage devoted to prevention studies is imperative to continue prevention research to fulfill this goal in the strategic plan and for continued progress in population health. Regarding the critical importance of maintaining and growing the portfolio of the Prevention branch of DESPR I refer you to the Society for Prevention Research comments submitted in response to the NIDA RFA regarding the 2015 NIDA Strategic Plan. I reproduce their overview below. Biglan, A (2015) The Nurture Effect: The Evolution of Behavioral Science, Psychology Today, 1/5/15. Campbell FA, Ramey CT, Pungello E, Sparling J, Miller-Johnson S. (2002) Early childhood education: Young adult outcomes from the Abecedarian Project. Appl Dev Sci, 6(1):42-57. Catalano, R. F., Fagan, A. A., Gavin, L. E., Greenberg, M. T., Irwin, C. E., Ross, D. A., & Shek, D. T. L. (2012). Worldwide application of the prevention science research base in adolescent health. Lancet, 379, 1653-1664. Clark DB, Cornelius JR, Kirisci L, Tarter RE. (2005) Childhood risk categories for adolescent substance involvement: A general liability typology. Drug Alcohol Depend. 77(1):13-21. Conduct Problems Prevention Research Group. (2014). Impact of early intervention on psychopathology, crime, and well-being at age 25. Am J Psychiatry..
Hale DR, Fitzgerald-Yau N, Mark Viner R. (2014) A systematic review of effective interventions for reducing multiple health risk behaviors in adolescence. Am J Public Health.104(5). Hawkins JD. (2006) Science, social work, prevention: Finding the intersections. Soc Work Res. 30(3):137-152. Hill KG, Bailey JA, Hawkins JD, et al. (2014) The onset of STI diagnosis through Age 30: Results from the Seattle Social Development Project intervention. Prev Sci. ;15 (Suppl 1):S19-S32. O'Connell ME, Boat T, Warner KE, editors. (2009) Preventing mental, emotional, and behavioral disorders among young people: Progress and possibilities. Washington, DC: National Academies Press. Sloboda, Z. (2012) Substance Use & Misuse, 47:1557–1568, 2012. Western B, Pettit B. (2010) Incarceration & social inequality. Daedalus. 139(3):8-19,146-147. Woolf SH. (2008) The power of prevention and what it requires. JAMA. 299(20):2437-2439. The Institute of Medicine concluded that the most effective way to halt the manifestation of substance use and allied behavioral health disorders is through prevention. I am concerned that the reorganization will reduce NIDA’s commitment to prevention science. For example, will the proposed trans-divisional research teams pay equal attention to prevention and treatment? I strongly support the recommendations the Society for Prevention Research made in response to NIH Request For Information (NOT-DA-15-005) about NIDA’s FY 2016-2020 Strategic Plan. It is imperative that NIDA increase, not decrease, the percentage of its budget devoted to prevention studies for continued progress in population health. I urge NIDA to give prevention a more prominent role in its strategic and reorganization plans to support this goal. To me, this plan over-emphasizes neuro-science at the expense of prevention. While basic research is to be encouraged, NIDA is funded that way it is in part because it delivers practical results while developing prevention science. I think the plan loses sight of this and creates an imbalance that will have long term negative consequences for the field and for NIDA. I find myself wondering what the proposed reorganization means vis-a-vis role of prevention research in NIDA’s research priorities. Will this reorganization reduce NIDA’s longstanding commitment to prevention science? For example, will the proposed trans-divisional research teams pay equal attention to prevention and treatment? I support the Society for Prevention Research's recommendations made in response to NIH Request For Information (NOT-DA-15-005) concerning NIDA’s FY 2016-2020 Strategic Plan. The Institute of Medicine concluded that the most effective way to halt the manifestation of substance use and allied behavioral health disorders is through prevention. NIDA should therefore increase rather than decrease the percentage of budget devoted to prevention studies for continued progress in population health. I respectfully urge NIDA to give prevention a more prominent role in its strategic and reorganization plans to support this goal. Thank you for the opportunity to respond to the suggested changes in the organizational structure of NIDA as well as peer review of research applications. I would echo the sentiments of several of the scientists who have already commented with respect to the emphasis on prevention science. The progress made over the past 20 years in developing an empirical foundation for prevention science is undeniably optimistic (see IOM, 2009; Biglan, 2015 for reviews). At this critical juncture, we should make sure that we accelerate the systematic study of prevention strategies and solutions. The rapid cohort changes in various forms of addictive behaviors as well as the co-morbidity of addictive behaviors with multiple mental health problems, suggest that we need to both understand the developmental processes underlying the proximal dynamics of addiction and other mental health problems, and link those findings to cost effective and timely prevention strategies. Having participated in two review committees (eight years of being a standing member of 2 different review committees) it is clear that we need a unique review panel for translational research with an emphasis on prevention. There are several reasons for this, but one is fundamentally scientific in nature. One of the key scientific issues in prevention research is identifying mediators for preventive strategies (short term targets that lead to long term reductions in drug use and addiction). When the peer review committee is not staffed with prevention scientists, then very promising science gets scored poorly and the science stops. Thus I agree with the comments that prevention science that focuses on mediation is often unappreciated by scientists without prevention expertise, and therefore, translational prevention research should be kept within DESPR and not integrated into the clinical research grants. Second, I am concerned with the movement from an explicit funding strategy that basically follows peer review scores, to an implicit strategy of funding research that neglects peer review scores in the final funding consideration. I would propose that we make available anonymous peer review scores and final funding decisions for community review and discussion. The NIH carefully developed and adapted a peer review system that is the envy of the world. We need to maintain and respect the integrity of this system. I appreciate your request for feedback on the scientific and organizational agenda of NIDA. Given the rapid change in the science as well as community factors that affect the prevalence and nature of addictive behaviors, we need a healthy dialogue from diverse scientific and community perspectives on NIDA future directions. I want to provide some clarification around the place of prevention research at NIDA, based on some of the comments thus far received. First of all, there seems to be a misperception that prevention research would be moved out of its current home within the Division of Epidemiology, Services and Prevention Research (DESPR), which is not the case. Secondly, none of the changes envisioned as part of the reorganization should be taken as an indication that NIDA is any less committed than ever to prevention research. Prevention remains a priority for our Institute, as abundant research has supported its importance in addressing substance use and abuse. In addition to the work being done in DESPR, research in our other divisions also informs (and will continue to inform) our prevention intervention portfolio, including basic research on factors such as genetics and epigenetics that make a person vulnerable to substance use disorders and the effects of neurodevelopment on susceptibility to drug use and addiction. Such research helps us better target our prevention research efforts. Fabulous that you are integrating medication and behavioral therapies into a new division that will include all aspect of treatment. I think that keeping all aspects of treatment development in one division is important. In order to maximize the chances of implementing new treatments and of improved modifications to treatments it seems to me that it is critical to acknowledge the importance of real world treatment development as an important form of treatment development. Research, adapting new and/or old treatments to various clinical populations and effectiveness research that modifies interventions to fit specific provider populations, should, in my opinion should also be merged with the new behavioral therapies treatment division. From my perspective, each of these approaches to treatment fall within the category of treatment and and treatment development. Hope these comments are useful. Thanks for all your work and I love that you sent us so much information and asked for comments. It is great to see that treatment development and testing will be kept together in one treatment Division. The emphasis on mechanisms will help to propel the field forward. I know that NIDA takes the problem of the implementation of efficacious treatments seriously, and has supported ground-breaking research on treatment development and modification aimed at making treatments easy to deliver correctly and on a large-scale (for example, NIDA has been a leader in computerizing treatment, mobile technologies etc). This type of real world treatment development -"Stage I" to adapt and modify treatments to make them more readily usable in the community- and "Stage III" efficacy testing- is a critically important part of the inherently iterative and recursive treatment development process. Without this type of treatment development research, there is a risk that treatments will not be implemented correctly, in the way they were intended- and in the way they were implemented when they were shown to work in rigorous research trials. On the other hand, if real-world treatment development continues to be emphasized as a critical part of the treatment development process, it should greatly facilitate implementation. It is imperative that treatment developers devote considerable attention to real-world treatment development and I hope that there is continued emphasis on this within the newly-established treatment division. Such treatment development and efficacy testing with real-world practitioners is an essential precursor to effectiveness and implementation research. NIDA. "Seeking Input from the Community on NIDA’s Scientific Reorganization." National Institute on Drug Abuse, 12 Jun. 2015, https://www.drugabuse.gov/about-nida/noras-blog/2015/06/seeking-input-community-nidas-scientific-reorganization. NIDA. Seeking Input from the Community on NIDA’s Scientific Reorganization. National Institute on Drug Abuse website. https://www.drugabuse.gov/about-nida/noras-blog/2015/06/seeking-input-community-nidas-scientific-reorganization. June 12, 2015.